It is not every motorcycle that can lay claim to being the first of its kind. One that can is the GSX-R750. 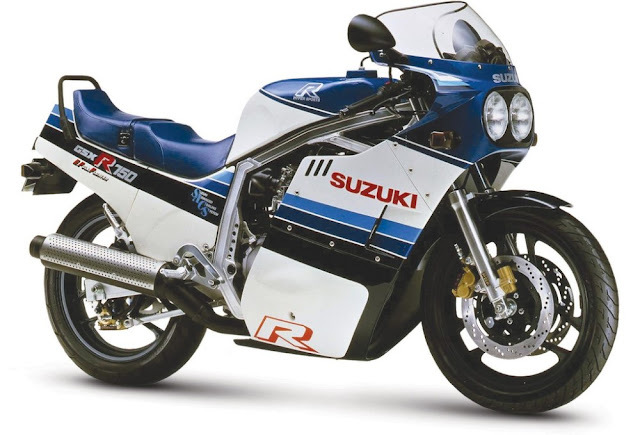 So closely did its design echo that of Suzuki's 1985 endurance racer, that it was dubbed a 'race-replica'. In performance terms, too, it did not fall far short. 145mph on a road-bike was not for the faint-hearted! So, the 'Gixer' was built to go fast. Corners were no obstacle to that mission statement! The GSX-R's aluminium chassis - and beefy front forks - rendered it highly 'flickable'. Powering out of bends, though, needed the rev-needle pointed firmly to the right. The power-band was uncompromising, to say the least. Low-down 'grunt', then, was not the GSX-R's strong suit! But, when retardation was required, state-of-the-art 'stoppers' responded with zeal. The GSX-R was dubbed the 'slab-side' ... due to its perpendicular proportions. Its looks certainly communicated a sense of purpose. Indeed, single-handedly, the Gixer fired up the 'race-rep' revolution. After the Suzuki GSX-R750, road-bikes really would never be the same again!